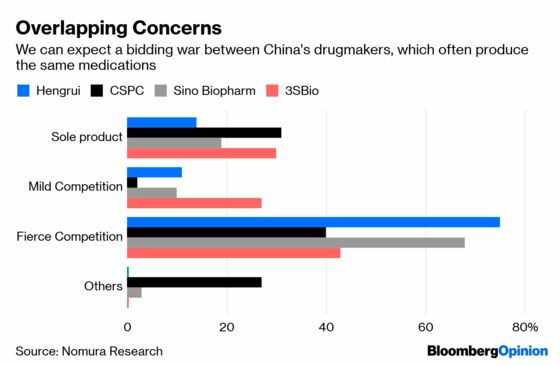 (Bloomberg Opinion) -- For a country whose GDP per capita is only 15 percent that of the U.S., consumers in China are paying remarkably high drug prices. The U.S. isn’t famed for its low-cost pharmaceuticals – but prices of generics are on average only 55 percent of those in China, according to a recent Credit Suisse Group AG report. For instance, Jiangsu Hengrui Medicine Co.’s Docetaxel, a chemotherapy medication that treats a number of cancers, costs one-third less in the U.S. Or consider Levamlodipine, a cardiovascular drug. If CSPC Pharmaceutical Group Ltd. charged prices similar to those prevailing in the U.S., it would see 5 percent of its annual revenue gone. Soaring healthcare costs in China have become such a social issue that it came up at Premier Li Keqiang’s annual press conference last Friday. It’s not right that many elderly people see most of their pension benefits spent on daily doses to manage chronic diseases, and the social insurance system will broaden its coverage and raise reimbursement rates, he said. For years, the nation’s largest drugmakers happily sold low-cost generic medicines yielding gross margins of 80 percent to 90 percent without giving much thought to consumer protection or innovation. Adding insult to injury, many of the drugs are no good. There are more than 4,000 generic drugs waiting to pass the government’s new bio-equivalence tests, and as of last November, only 40 of those drugs have demonstrated that they work as well as the original formula. A price war is brewing. Already, local governments of 11 cities are taking over procurement of drugs for their hospitals. In an early December bidding round, the average tender price was 55 percent lower than the previous auction. The new bidding system will eventually be extended nationwide. It’s just a matter of time before Indian manufacturers, which make better drugs, enter the $160 billion Chinese market. Foreign drugs that had been approved by the U.S. and European Union can now get the Chinese regulator’s nod in as little as one year, versus two to three years for domestic producers. When it comes to generics, Beijing isn’t protective of the home team. 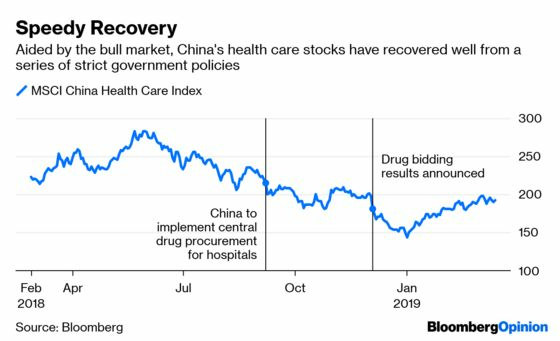 If you’ve still got lingering doubts about whether Beijing will play hardball on drug prices, take a look at the government’s fiscal situation. In China, healthcare costs are mainly covered by state medical insurance and by patients themselves. Private health insurance only plays a very small part. Without government subsidies, China’s 2.3 trillion yuan ($343 billion) social insurance fund would have been in deficit as early as 2011, the earliest comparable data available. In 2018, subsidies accounted for about a quarter of the fund’s total revenue. There’s good reason to believe the funding gap will widen further. 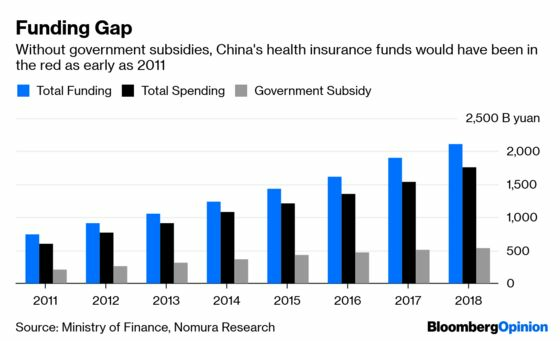 China’s medical insurance fund is broadly divided into two sections: individual saving accounts which are mostly funded by companies and their employees’ social security contributions, and a social pooling fund, propped up by subsidies from the Ministry of Finance. Starting May 1, China will cut the onerous social security burdens companies have to shoulder, which means these individual savings accounts will need more government support, too. China’s $3 trillion foreign exchange reserve masks the big financing headaches the government faces. While China’s stated fiscal deficit target for 2019 is only 2.8 percent (lower than the international standard of 3 percent), the actual deficit, including hidden debt issued by local governments, could be in the neighborhood of 8 percent. Beijing isn’t going to cut corners on the middle class in its need for healthcare, because that’s an important social issue; nor does it want to plunge further into a deficit hole. So what will give? The most likely option is that Beijing squeezes out more of the drugmakers’ fat. Buyers beware.